American Idol 2013 judges lineup is now complete! FOX has officially announced Sunday, September 16, that rapper Nicki Minaj and country singer Keith Urban are new American Idol judges, joining the also new judge Mariah Carey and long-time judge Randy Jackson. The announcement came after weeks of speculations about Nicki Minaj and Keith Urban as 2 new judges who will join Mariah Carey for American Idol 2013. Mariah signed for American Idol 2013 in July, after J-Lo and Steven Tyler vacated their seats in the show. And contrary to previous reports that Randy Jackson will no longer return as a judge and will just serve as mentor to the finalists, well, the 11-time American Idol judge will still be a judge for the 12th season, whether you like it or not. 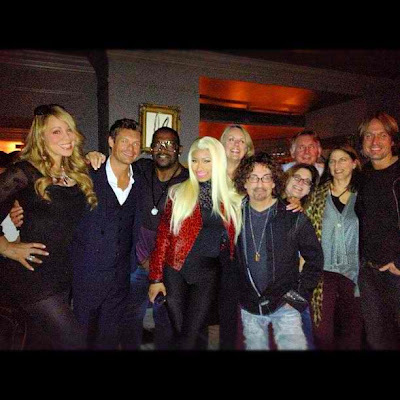 On Twitter, show's host Ryan Seacrest shared this photo of him with the 4 American Idol 2013 judges.